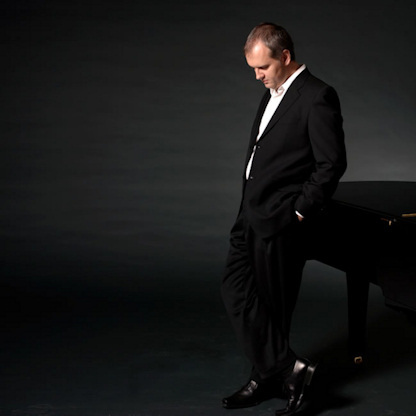 Born in the United States in 1970, Nicholas Angelich began studying piano at the age of five. Two years later, he played his first concert performing Mozart’s Concerto K. 467. He entered the Conservatoire National Supérieur de Musique in Paris at thirteen, where he studied with Aldo Ciccolini, Yvonne Loriod, and Michel Béroff, and won first prize for piano and chamber music. He also participated in masterclasses with Leon Fleisher, Dmitri Bashkirov, and Maria João Pires, and was a resident of the International Piano Foundation of Cadennabia in Italy. Nicholas Angelich is a prizewinner of numerous piano competitions, including the International Piano Competition Robert Casadesus in Cleveland and the International Piano Competition Gina Bachauer. In June 2003, he received the “International Klavierfestival Ruhr - Young Talent Award” from Leon Fleischer. In May 2003, he made his debut with the New York Philharmonic under Kurt Masur at Lincoln Center. In the 2007-08 season Vladimir Jurowski invited him to play with the Russian National Orchestra for their opening concert. The pianist has also performed with the Orchestre National de France under Marc Minkowski and Joseph Pons, Orchestre Philharmonique de Radio France, Orchestre National de Lyon under David Robertson, Orchestre National de Bordeaux under Yutako Sado, Orchestre National de Lille under Matthias Bamert, Orchestre Philharmonique de Monte-Carlo under Jesus Lopez-Cobos and Kenneth Montgomery, Orchestre de Liège and Saint-Petersbourg Symphony under Alexandre Dimitriev, Strasbourg and Montpellier orchestras under Jerzy Semkow, Toulouse Orchestra under Jaap van Zweden and Yannick Nézet-Séquin, Orchestre de Chambre de Lausanne under Christian Zacharias, SWR Baden-Baden Orchestra under Michael Gielen, Frankfurt Radio Orchestra and Atlanta Symphony under Hugh Wolff, Cincinnati Symphony under Paavo Järvi, Stephane Deneve, and Iván Fischer, and the Indianapolis Symphony under Jesus Lopez-Cobos. An impressive interpreter of the classical and romantic repertoire, he has given many performances featuring the works of Beethoven and Liszt in Europe and North America, including France (La Roque d’Anthéron, Toulouse, Nantes), Germany (Klavierfestival Ruhr, Bayer Leverkusen), Italy (Brescia), Spain (Bilbao), Canada (La Lanaudière), and the United States (Washington, DC). He has also gained recognition for his interpretation of 20th century music, including performances of works by Rachmaninov, Prokofiev, Shostakovich, Bartok, Ravel, Messiaen, Stockhausen, Boulez, Tanguy, and Pierre Henry, who dedicated his composition “Concerto for piano without orchestra” to him. Nicholas Angelich’s chamber collaborations include critically acclaimed performances with Dimitri Sitkovetsky, Joshua Bell, Gérard Caussé, Alexander Kniazev, Jian Wang, Paul Meyer, the Ysaÿe and Prazak Quartets, and Gautier and Renaud Capuçon. His recording of the Brahms Trios with the Capuçons for Virgin Classics was awarded the German Record Critics’ Prize. Mr. Angelich has also released recordings for Harmonia Mundi, Lyrinx, and Mirare. Recent engagements include concerts with the Rotterdam Philharmonic, Orchestre Métropolitain de Montréal, Montreal Symphony, Atlanta Symphony, Seoul Philharmonic, Stuttgart Radio Orchestra, and a tour with the London Philharmonic. In July 2009 Mr. Angelich made his BBC Proms debut with the Scottish Chamber Orchestra under Yannick Nézet-Séguin. The pianist collaborated with Yannick again in August 2009 at the Mostly Mozart Festival, performing Mozart’s Piano Concerto No. 20. 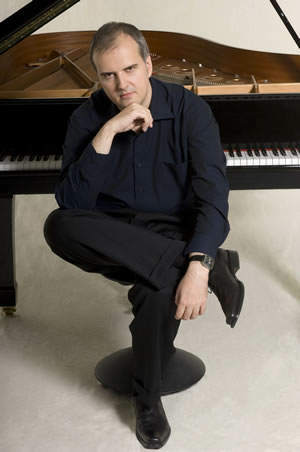 His engagements for the 2009-10 season included Beethoven’s Piano Concerto No. 5 with the Royal Philharmonic Orchestra under Charles Dutoit, and his Philadelphia Orchestra debut performing Brahms Piano Concerto No. 1 under Yannick Nézet-Séguin. In the 2010-11 season he will make his recital debut with the Metropolitan Museum of Art’s Concert and Lecture series, and his Los Angeles Philharmonic debut under Stéphane Denève. I met Nicholas Angelich a few hours after his arrival in Rotterdam, where he would perform Saint-Saëns's Fifth Piano Concerto with the Rotterdam Philharmonic under its music director Yannick Nézet-Séguin. You performed and recorded a lot of Brahms's music. Summarising what you have recorded in the meantime there is a lot of Brahms in there: the Ballades Op. 10, the Fantasies Op. 116, the Intermezzi Op. 117, the two Rhapsodies Op. 79, the Piano Trios and Quartets with the two Capuçon brothers, the three Violin Sonatas with Renaud Capuçon (you also did two with Laurent Verney), the Hungarian Dances with Frank Baley, the First Piano Concerto with the Frankfurt Radio Symphony Orchestra under Paavo Järvi and quite recently with the same forces the B flat Piano Concerto plus the Eight Piano Pieces Op. 76. Why is Brahms so attractive to you? I have lived with his music for a very long time. When I was a young boy I heard a lot of Brahms's music played in the house. So you could say that I owe my love for Brahms to my parents. One of the many records I vividly remember from that period is that with the B flat Piano Concerto, with Wilhelm Backhaus at the piano and Karl Böhm conducting. It's just amazing, his playing. I know of another recording I greatly admire, the one with Edwin Fischer and the Berlin Philharmonic conducted by Wilhelm Furtwängler. That must have been the 1942 live recording which was released a long time ago by Deutsche Grammophon, and released on CD by the Testament label. This is one of the most spontaneous and thrust filled recordings of the Brahms B flat I have ever heard, even better still than the Decca studio recording from 1967. Very much so and yes, it was a live recording. I have listened to it many, many times and it comes close to what I feel is my ideal perspective of this great music. I think I studied this concerto for the first time when I was about fourteen. I started to study Brahms’s piano music when I was a little bit younger still, with the F minor Piano Sonata. What would you say about the quality of those performances by Backhaus and Fischer? Did you recognise the visionary element in these? Well, they are very different. Backhaus had the kind of clear overview of the structure. He sounds so natural and powerful but at the same time also very sensitive. His and Böhm’s performance is so filled with inner logic that it is totally amazing. This is all quite perceptive, beautifully coloured, lucid and transparent in the best sense of the word. The Fischer/Furtwängler performance is also highly inspired, but here the structure is shaped in a completely different way. And Furtwängler’s conducting is really incredible. As always with his conducting there is that sense of flexibility with at the same time the stability of the structure, as if you can almost touch it. Despite those tempo fluctuations and that great sense of spontaneity he never loses the full control over the piece. Not necessarily the kind of control in the sense of straight and strict, but its lively three-dimensional disposition within the whole framework. Of course, this concerto can be performed in many different ways, but I think that in the kind of performance by Fischer and Furtwängler you can grasp the full sense and scope of this work, its full meaning so to speak. The way they are doing things together is really incredible. … in the phrasing and in understanding the psychological form of the music, as well as expressing the emotions in a very sincere and true way, whereas the intellect should also speak. There are people who say that it is one way or the other, it is either expressive or intellectual, but I think that you need to have both. All great musicians offer that unique mix of spontaneity and thought. This is one of the credentials of great art. Do you agree that each performance should have a basic pulse which adds to the overall structure of the piece and by which the listener can feel at home, not to say secure? This could also contribute to make the variety of complexities more understandable, or even – like in contemporary music – more accessible? Yes! This is also a very important element that makes or even kills the performance. You know, the pulse also reveals in a way that musicians are human beings, how they express themselves as real people. When you play you disclose a lot about yourself. I don’t mean hat you are there to show yourself off, but that your personality, your character as a musician is in the music, in the interpretation. Like for example different actors playing the same role. It should never be something which you underline in a very simplistic way, to show yourself off. A piece of music is not just for that, it does not need that. What about the conductor’s personality? I can hardly imagine that you, as a soloist in a piano concerto, simply take the orchestral part as it comes. The conductor’s fingerprint is in the music as well. It may be very convenient when he follows your path, but things happen to be much less compliant. At any rate, I believe that the necessity to find ample musical space for each other’s views is more difficult in a work like Brahms’s B flat Concerto than in for instance Beethoven’s Emperor Concerto, which has – compared to he Brahms – a rather straight-forward orchestral part that does not need the flexibility of the Brahms. The Brahms Concerto is very, very special in that. In a way it is a symphony with the piano inside, and at the same time it is both a real concerto and chamber music! Soloist and conductor need to be able to make that all happen. Of course, when you don’t have a good relationship with the conductor you will not be able to find something that will musically work for you. That applies to any concerto, but even more strongly to the Brahms. When you cannot change anything or if your views are more or less ignored you are lost as a soloist. Would you say that the second movement is a scherzo? You know what Brahms said to one of his friends, that he just had finished his ‘tiny piano concerto’ with a ‘tiny, tiny scherzo’. This is ridiculous! It is such a huge, amazing work! A scherzo? I don’t know for sure. It is not really humoristic, not witty. To me it makes the impression of a revolt, an extraordinarily dramatic and powerful gesture. It comes after an already very powerful first movement. Yes, but the second movement is very different from the first one, where it is extremely difficult to bring off. As said, the conductor’s role is very, very important here, not just in coming to terms with each other about for instance the right tempo, the phrasings and the dynamics, but moreover in sharing an overall vision of the piece. No one should stick to his own pattern in some inert fashion but should listen to the other and be prepared to make changes. Did that work with Paavo Järvi? You also recorded the First Piano Concerto with him. He is an amazingly strong musical personality and at the same time so flexible! I could very much rely on him. It all comes down to confidence and good communication, and of having a very clear picture in your head about what you want to achieve together. You are not on an island, you know! You cannot simply do your thing and leave it at that. A lot of synergy can be created when each and everything works together as it should. Did you have those famous recordings in your mind when you started working on the concerto? Notwithstanding the immense respect and love I have for all those great recordings which we have known for years, I have to try at the same time my own fresh approach which is purely based on the musical text and to do it in my own way. It is not good to get into the footsteps of somebody else. This would not only be very bad for me but finally it would not work at all. In fact we should never lose our own individuality in making music. Yes, to be as original as this can go. You know, Brahms who had to get rid of Beethoven’s shadow, who was told by Hans von Bülow that the First symphony was frankly Beethoven’s Tenth (Brahms: ‘and any idiot can hear that’). He had to go through this process. Indeed. When you are a younger musician and you have made your first recording, this is fine, but you must always keep in mind that you need to look much further than that and understand that the music itself does not evolve, but that you should. Music has to live, to breathe, what is on paper needs to be brought to life, and this is a mysterious process. You may admire all these great recordings from the past, but when you feel that the time has come that you are ready to record it, this really must be based on your own musical identity, your own character and the clear perception that you actually have something to say about that piece. You give it a very hard try and you do your very, very best to make the most out of it. What did you do with Brahms’s own metronome markings in the B flat Concerto? Did you just follow them? They are in the manuscript and in all printed scores. They are very important, although they should not be considered the composer’s definite statement, some kind of stiff law making. It applies to all composers that their vision could change, or the actual acoustic setting differs from what they may have had in mind. But also their ideas could have changed by time and by experience, as can be heard on those recordings where they play or conduct their own music. In this sense it is very important to take the score and ask yourself good questions about it, and that you constantly go back to it, even if you think you know it very well, even from memory. The more you look into it in the course of time, the more new fresh details you will see. Details which you might not have interpreted in the same way before, or even overlooked, give so much added value! Additionally it is a great thing, to see both the whole, the global structure and the inside with its often quite minor details. This enables you to grasp, to reconcile the connection between the great picture, the overall framework and the inner detailing of the piece. If you are doing something in your interpretation, in a certain line, that might perhaps sound beautiful in a way, but which has no connection to the whole, then something is plainly not right. We always try to find out what sounds right and what is right. Is this a kind of intellectual exercise? Maybe, but I would say that it is also a matter of instinct, with the score as the leading voice for the interpretation. So coming back to the metronome markings, yes, they are very important, but at the same time you need to look much further than that. There are so many, many things in the score which should be considered as well. And the more experienced you get, the more you have lived with a score, the better you will develop your interpretative skills and comprehend and appreciate specific new aspects of it, or familiar ones but in quite a different light. You know, music is a living organism and not something inert, albeit it has been meticulously written down on paper. Does it happen that you feel you are interpreting, playing against your intuition? Yes, it happens that I play something from the score that I don’t quite get. The inner logic of a certain phrase, or some dynamic markings, things like that. I might feel that it is not right, but then I take a very long and hard look at it, because I simply can’t do something different! I need time to work it all out, to find an adequate solution. It might sound superfluous that you cannot simply change something which has been clearly written in the score, just because you don’t like or understand it; although musical history is crowded with that. You can try to understand certain things in the score. Some composers have written special indications in the score, which you need to understand. For instance sforzato: in which context should it be read, interpreted? Take Beethoven’s sforzato markings for instance, which I think are really complicated because you need to integrate these with at least some kind of perception of the scope of the music. In terms of gradation for instance. And there are always those peculiarities we need to reconcile. For instance in Schubert’s piano works, where there are no dynamic indications on many pages. I think it was Alfred Brendel who was one of the first pointing that out. We also had different appreciations about the dynamic markings in Schubert’s manuscripts, for instance of his symphonies. I remember the so-called ‘revised’ Schubert symphony edition as it was recorded by Wolfgang Sawallisch and the Staatskapelle Dresden on the Philips label, about forty years ago. For many they happened to be a revelation, not to say new works. We have had all these revised editions, those ‘Urtexts’. It is essential to have a good edition, but even beyond that you must be very critical. For instance, one piano marking does not necessarily need to sound identical to another piano marking in the score. In one place or in the other, the performer should always ask himself in which context it should be played. That context has its own character, its own musical sense and meaning. Many aspects in the score should lead the way to the right approach. How do you resolve issues like these in contemporary music? When you have less experience, less if any historical background or setting to rely upon? This can be very difficult, but let me tell you something. When I was sixteen I played for Pierre Boulez his Second Piano Sonata. There are so many things written in this score, of which I had thought he would tell me I should have done it differently, but I was highly surprised when he did not do that at all. He was talking to me about the flow, the sense of movement in this music, that you had to follow it, and he showed me by his conducting. He is such an exceptional conductor. Somehow, looking at the score and feeling this kind of movement, lots of things became quite clear to me, they were breathing more and more. What he told me was really something. These were very simple things but they stay with you. A kind of natural ebb and flow? Yes, yes! It is fascinating and revealing, not to say exciting to speak to a composer who is still alive, to discuss his work with him. This is an enormous advantage and privilege that goes beyond anything else. Of course, with contemporary music we don’t have that particular kind of knowledge of the music from the past with all those gradually developed performance traditions. Instead, there is that special sense of adventure, discovery and freedom. That makes it so very different. But we can definitely learn from the way we play other kinds of music and use that for our interpretations of contemporary music, in terms of sound, of contrast and so on. Contemporary music is no blank spot, it does not come out of nothing but is strongly indebted to the music of the past. Schoenberg once said that the need to invent the twelve tone system was based on hundreds of years of music. I believe that for musicians it is important to play contemporary music. 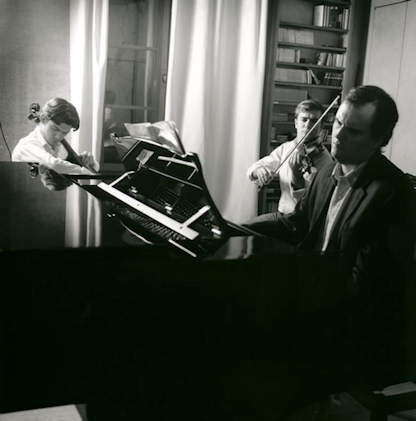 I studied with Olivier Messiaen’s wife, Yvonne Loriod, and I played for him several times. He was very kind to me and I was very much impressed by his unpretentiousness. He was such a warm and modest personality! Despite all his triumphs he was still much surprised after a good concert. I did not play much of his music of late because I have so many other things on hand. As pianists we are very lucky that we have so much fascinating repertoire, but that is why we need to make often difficult choices. How do you compile your concert programmes? The first thing in there is my very own desire to play specific works I love with all my heart. That is my starting point. At the same time you have to combine works together to shape a program that is either based on logic or contrast. Like different works of art in a gallery, but sensing that they can ‘work’ together, that the mixture makes sense. Another aspect of it is that I make my choices with the potential appreciation by the audience in mind. Also, it can be very stimulating when someone asks you to put a specific composer or work on your programme. For example, a couple of years ago I performed Liszt’s entire Années de pélerinage in one single concert. I also recorded it. The idea for this project came from René Martin, the director of the Festival La Roque d´Antheron and Les Folles Journées de Nantes. He said to me: “You should play the whole thing, it is really beautiful and I gather that it has not been done before. It would be a great thing if you could do it.” So I did and it appeared to be a huge adventure, not only for me. This is when somebody wants you to do a project like this, or to play specific music. And it gives you another mishmash of ideas. That Liszt project was certainly not easy to bring off, there are very demanding pieces in these Swiss and Italian series, but I was very familiar with Liszt’s music, although a performance like this comes a very long way. Do you see any connection between Brahms and Liszt? Not particularly. The only link I see is that they both knew how to write for the piano, be it in a different though very impressive way. They knew the ins and outs of the instrument and they had a very natural way of composing for it. Liszt was like a revolution for the piano and he opened up many new things for the future. At the same time I think that Brahms looked more into the future than one would think, but in a dissimilar way. Some people say that he was a very academic person, but I don’t think so. He had an extremely great talent for musical form and for contrast, like in those many little piano pieces. He was not the kind of composer who solely wrote in sonata form. Indeed he wrote sonatas at the beginning of his career, but they were already so crazy! And what he wrote later on was so different, those rhapsodies, the intermezzi, those small piano pieces, all that. There was so much more variety in his musical characterisation, it was so diverse, there were so many different things going on that from this perspective alone it is so far-fetched. We know about the personal relationship between Brahms and Robert and Clara Schumann. Is there also a purely musical connection between Brahms and Schumann? Definitely so, I think. For instance, the Piano Pieces Op. 76, which I recorded together with the B flat Concerto have something in common with Schumann’s piano music. In a way they have a more experimental quality than the later pieces, Op. 116 and Op. 117. The late pieces are autumnal Brahms so to speak, with reflection and contemplation as their dominant character. It appears to me that Brahms is rooted in the present but that he looks back. I find a lot of nostalgia in there. Yes, absolutely. I think this is very true, but at the same time these pieces are very modern in terms of sound, harmony and structure. They are even strange at times, but each and every one is filled with an incredible maturity. And as you say, the kind of nostalgia, introspection and retrospection but at the same time he is again looking at the future. It is a very strange mix really. I think Brahms must have been a very eccentric person. At any rate, in musical terms much less conventional than one might think. All great composers prove to be unconventional. That is very stimulating, in so many ways. They bring us something that can uplift us, disturb us and make us wonder. This all contributes to enjoying their music. Even if there is a hint of something being conventional you can be sure that further along the path they go far beyond that. With Brahms I feel that this is very important to appreciate, while so many people say that his music is rigid, or strict, or academic. I don’t think that this does any justice to his greatness. It is good to perform his music often and as good as I can to show just the opposite. It is so adventurous, all those great themes he created and the way he explored them! From the harmonic perspective alone this is really modern music. I have always found his First Piano Concerto his most daring piece. His Second Piano Concerto is quite different. Yes, the First Concerto is really something, it stands on its own. Would you agree that composers explored their deepest thoughts and technical skills in their chamber music? As if this art form offered them music making without borders or limits, without any necessity to keep their eye and ear on the limited technical possibilities of orchestral instruments such as brass and woodwind? I hear in their orchestral music the desire to create the kind of momentum that mainly serves a broad public and much less so the connoisseurs. I think that by its nature chamber music requires more complex writing anyway. There is a huge difference in texture between chamber and orchestral music? Yes and no. I would say that chamber music is more revealing, more naked in a way. Symphonic music is on a grander scale. And irrespective of those instrumental limitations there is always the composer’s personal statement involved, his own fingerprint. For instance, Brahms wrote his four symphonies and there has always been that comparison with Beethoven, but at the same time he did compose something quite different. He did not write like Beethoven, on the contrary. But indeed, I must say that when comparing for instance his piano concertos with his chamber music the latter is quite different from many angles. The treatment of the piano and of other instruments is very different, as with every composer. Just take his piano pieces, and hear the differences in pure sound between what he and what others wrote. It is the highly personal way in which Brahms let the instrument sound; as Schubert, Schumann, not to speak of Chopin did in their own inimitable way. Brahms was an excellent pianist, as Mozart, Beethoven, Schumann, Liszt and Rachmaninov were, to name just a few. Is there any correlation between their pianistic abilities and their composing for the instrument? I think there is. That is not the only aspect of it, but it is a very important one. You can feel that in the composer’s writing. Rachmaninov, of course! He is a prime example of that. Why do you play Saint-Saëns’s Fifth Piano Concerto here, in Rotterdam? The work is rather unknown and rarely performed – quite the opposite of his G minor Concerto. It is a strange piece, with those mysteriously fragrant tunes from the Nile borders, from ancient Egypt. I love the recording of the piece by Aldo Ciccolini and the Orchestre de Paris conducted by Serge Baudo, which dates back to the seventies. It is a peculiar piece, which I like very much. Talking about great pianists as a composer: Saint-Saëns was one too! This concerto is very interesting. People may think of it as a kind of ‘light music’, but there is something in there that has ample depth, although you have to look for it. It is a strange but interesting and beautiful piece, which I wanted to try and play it. Sviatoslav Richter liked this concerto very much. Of course, I also performed the G minor Concerto, but the Fifth is very special to me. And yes, then there was Aldo playing it. Wow! But this is not the music that belongs to my main repertoire, which focuses on the German romantic composers, Beethoven, Brahms, Liszt, and so on. But also on twentieth-century music, and on Bach. I strongly believe that a musician should do different things, not always the same thing. He should explore! But it should always be something that you love and that you really want to do because it would not work otherwise. Yes, but you always need a full or nearly full hall. No matter how many great ideas you have there are those agents and concert managers who will tell you that without ample ticket sales no musical glory can be preserved. Some might find it sad but you need to come up with a concert programme that attracts enough people. That happens a lot. In the mainstream you have to play music people like, but at the same time you have to try new things, be it in sandwich setup. That is the problem with any audience: they are behind the composer. It seems to me that many composers have separated from the public. They live in creative isolation or in isolated creation. It is though, but I think that it is important as a performing artist to be adventurous. You must experiment and challenge, one way or the other and this is what I try to do. I try to be innovative but on my own terms and not by compromising performance standards or the music itself. Let’s face it: the young generation draws all the ‘benefits’ from a huge variety of gadgets which distracts from listening to serious music or from reading a good novel. Their capacity to focus has severely suffered from all that. Their lives are dominated by all sorts of quickly vaporising attractions. You hardly find these people in the concert hall. They might even belong to a lost generation when it comes to appreciating classical music, although there are little stars. Simon Rattle has showed with his keen experiments in Berlin that a young and motivated generation can be attracted to serious music. I reckon that it is very difficult indeed. We have to do much more to attract young people, also in terms of adequate musical education. Recently I was playing in Berlin as well. At the general rehearsal there was a bunch of students, from high school I think, about that age, and they were just great, they listened carefully, with lots of enthusiasm afterwards. Maybe we have to reconcile the way we do certain things, the form of the concerts, or where we play, etc. Yes, we should do a little bit of everything. When you only perform contemporary or fairly unattractive works the public is not interested in it is not good either. We would be on the wrong track but there is a lot open for discussion, there is a lot to be said about this. It is far from easy to find the appropriate balance. At the same time we should not avoid performing pieces which are popular with the public. It can happen. The audience in Berlin was spellbound at the performance of Bartók’s First Violin Sonata by Gidon Kremer and Martha Argerich. It may not be a contemporary work, but it is still considered a modern and a difficult piece for the public to grasp and to come to terms with. We have to continue. We cannot just stand still. We must respect musical history with its great performance traditions, but at the same token we need to go forward, to explore new grounds and to find new adventurous ways in presenting them. You definitely need that conviction as well as the inspiration and a deep desire to do it. To do a good deed is simply not enough. It has to be something really deeply felt. How do you handle discomforting or troublesome situations while you are en route? Music gives a lot. It is something you keep going back to. It demands a lot but it gives a lot. Moreover, music helps you as a human being to grow and to understand things better when time goes by. And problems are always there, irrespective of the work you do or where you are. But in performing music you need to invest your time, your life, there is no single doubt about that. For a performer music is almost all consuming. We can see what music can do. Like for those youngsters coming from the slums in South America, or those living in the epicentre of the Israelian-Palestinian conflict. Barenboim’s Eastern Divan Orchestra, initiatives like that. I think so. But there is also another thing which I think is highly important: that no musician should ever become blasé. It is and remains something special when somebody comes to you after the concert, saying that the music was so beautiful and thanking you for playing that. Of course, you know that it is beautiful, but when somebody brings that to you, it is really something. It is the task of every performing musician to make it worthwhile for the people to come to his concert. When it works he has communicated that to his audience. This is what I envisage and when I get there, it is very, very satisfying. On stage, enjoying those moments of great music together with a concentrated audience is and remains very special. There you are, all together, on the same track. Becoming blasé would be a happenstance, a twist of fate for any musician, but the question remains how you deal with the mental logistics behind your busy concert schedule. Before you really know you might live an isolated, not to say virtual, unreal life. It can be very isolated indeed, it is even necessary, but I am aware that it can also be dangerous. I therefore need to speak to people not necessarily involved in the music scene. I live in this highly complex world, I am part of it, I need to know what is going on and I need to up with everyday’s reality, as I would otherwise lose it. © Aart van der Wal.